The 9th Caucasus International Hospitality Fair (Horex Caucasus 2015) will take place from 2 to 4 April at the Baku Expo Center. Horex Caucasus is the only specialised exhibition for the hotel and restaurant industry in the region. The organisers of the exhibition are Iteca Caspian and ITE Group Plc. In the coming years a number of international events are planned to take place in Azerbaijan: the 1st European Games 2015, the FIDE World Chess Federation World Cup 2015, the Asian Development Bank (ADB) annual meeting 2015, the Chess Olympiad 2016, Round of the Formula One, the World Rally Championship (WRC) (2016) and the Islamic Solidarity Games 2017. With these events in mind there is currently a great deal of intensive building works take place to create new hotels, restaurants, sport complexes, and business centres, which makes HOREX Caucasus very relevant at the moment. 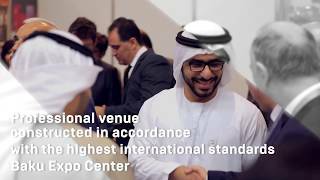 The exhibition will provide the opportunity to choose everything necessary for these newly built and prospective facilities: equipment, tableware, food products and drinks from leading international producers and distributors in the hospitality sector. Horex Caucasus 2015 will present leading companies from Azerbaijan, Italy, South Korea, Lithuania, Russia, and Turkey. Among the exhibitors will be Afidamp, Asena, Ateshe Makine Kazan, Billur MS, Coffee Planet Azerbaijan, GMG, Gunesh, Guven Halicilik, HoReCa, Hotstar, HRS (Hotel & Restaurant Systems), Hurom, Inter Isi, JSC Refra, Kaan Celik Kasa, Lactalis, Netsa Metal, RULOPAK Hijyen Sistemleri, Zama and others. Invited as visitors to the exhibition will be distributors and manufacturers of hotel, commercial, and kitchen equipment, general managers, marketing managers, IT managers, and buyers for hotels, restaurants and spas. Buyers for reception venues, supermarkets, catering services, leisure centres, health centres and fitness clubs, sanatoriums, and business centres will also be invited. In this way, Horex Caucasus will offer a unique platform for demonstrating new products and services. It also presents an opportunity to expand and establish new, effective and mutually beneficial links between customers and suppliers of equipment, technologies, goods and services on the hospitality market, and to settle profitable contracts and find credible contractors.